XCP Wallet for Chrome is a Chrome browser extension wallet for Counterparty that stores your secret passphrase locally in the browser with the option of client-side password encryption. The wallet is open source and available on Github and the Chrome Web Store. Deprecated, go to loon3/XCP-Wallet. Contribute to loon3/XCP-Wallet-for-Chrome development by creating an account on GitHub. Browser wallet for Bitcoin (bitcoin.org) and Counterparty Assets (counterparty.io). Got it installed (second, and best, XCP extension I have), thank you! This is an awesome wallet! 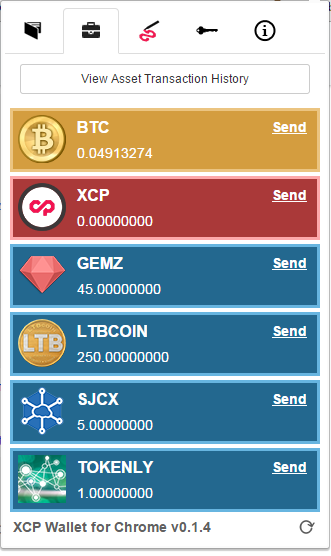 I too have been using this extension for a few days and it has made the xcp wallet so much easier to use. Kudos Joe! This XCP wallet rocks! EDIT: I did a brief security audit on the ‘XCP Wallet for Chrome’ extension and didn’t notice anything suspicious… no calls to external URLS other than blockchain explorers and APIs…. pretty sure your ok running the plugin, etc. Latest Release v0.1.4, now with asset icons! This is seriously awesome work, thanks!!! changed 9 files with 385 additions and 10 deletions. Broadcasts does not support Chinese. If you have a chance, submit the same broadcast text from both Counterwallet and XCP Wallet and post the tx ids here so I can compare. That will help in diagnosing the problem. The main difference is that the XCP Wallet defaults to XCP while the LTB Companion defaults to LTBCOIN and provides the current exchange rate. I find myself using both wallets as it’s a good way to help segregate your tokens. Protip: If you want more wallets for additional wallet passphrases you might have, you can download either wallet source from github and copy the Chrome Extension folder on your local machine as many times as you need wallets. Then, simply select Load Unpacked Extension at chrome://extensions (must be in Developer Mode). Perfect, thanks for the clarity One more question, i have this running on my test computer and i have not installed it on my work laptop because of the prompt it gives about accessing your clipboard. Obviously this is still new, but do you forsee any security leaks with installing this on a computer with sensitive information at this time, or should i continue running on my test machine? I feel comfortable running both extensions on any of my machines. The copy/paste permission is essential, otherwise the wallet would require you to manual type addresses which is not practical. You can download from Github if you’re concerned about the packed extension in the Chrome Web Store. Great job! This is a very clean wallet implementation. Great!!! very clean wallet implementation.